Size: 5.0" x 2.8" x 0.30"
This Toshiba SLC-8200 was introduced together with the SLC-8100 and followed the legendary SLC-8300. 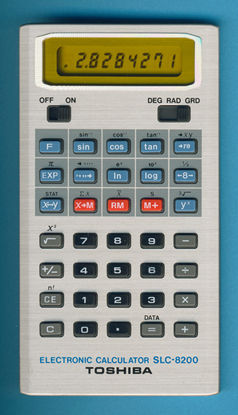 It was introduced in the year 1978 and predates even the TI-25. The calculator chip located with the SLC-8200 was manufactured by NEC in Japan and running Mike Sebastian's calculator forensics reveals with 8.99844408 a rather disappointing result. Nevertheless a huge improvement compared to the result of 8.9789682 calculated by Toshiba's T3636 design located in the SLC-8300. © Joerg Woerner, December 26, 2016. No reprints without written permission.